Unleash the hidden you by blasting off your excessive calories by 9 times with Turbo Fire August Discount Offer. Turbo Fire is a cardio conditioning workout -a combination of fun dance moves that will make your workout a fun experience. Upgrade your health with turbo fire meal plan and Shakeology and get absolutely ripped off in 90-days. 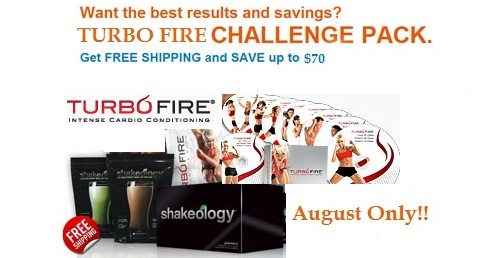 What is Turbo Fire Challenge Pack Sale Offer? This offer is valid until August 31st, 2013.